The cast of “Globe Live” on stage at the Paramount Center on Friday night. 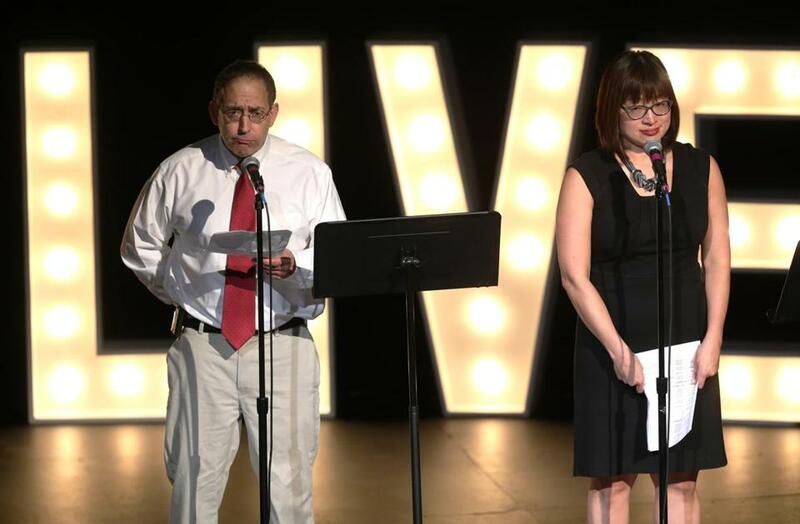 Journalists from The Boston Globe took to the stage Friday for “Globe Live,” a night of live storytelling at the Paramount Center. 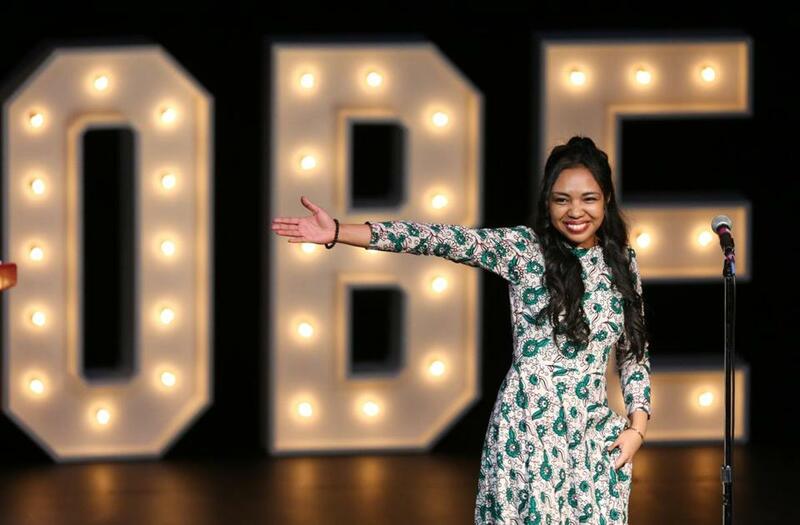 The theater was sold out for the Globe’s first-ever live storytelling event, and the 572 attendees were treated to a multimedia experience that included photography, video, music, and song. 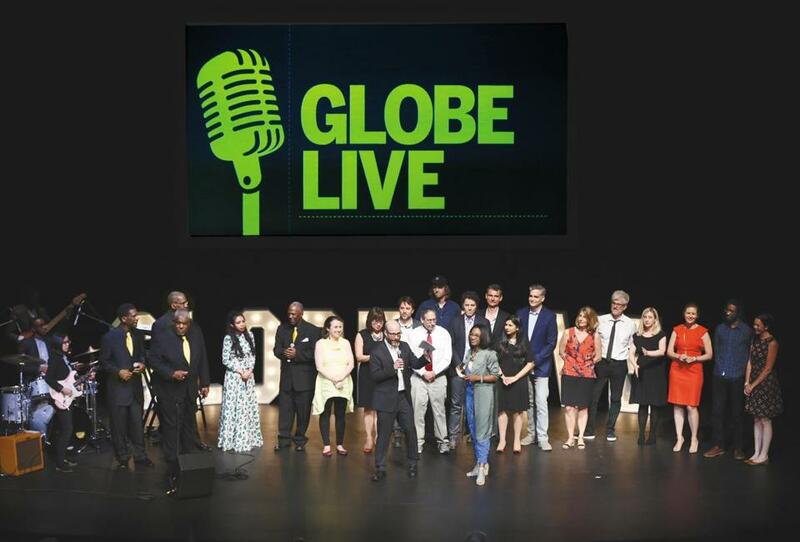 “Globe Live” featured more than a dozen journalists sharing intimate stories and behind-the-scenes anecdotes about their work — the kinds of details that typically don’t travel beyond the newsroom. Reporters Scott Helman and Akilah Johnson served as the emcees of the evening, and Sacha Pfeiffer kicked the show off with her humorous recollections of what it was like being portrayed by Rachel McAdams in the Oscar-winning film “Spotlight” and finding herself — a down-to-earth, khaki-wearing TJ Maxx fan — on the red carpet surrounded by Hollywood stars. 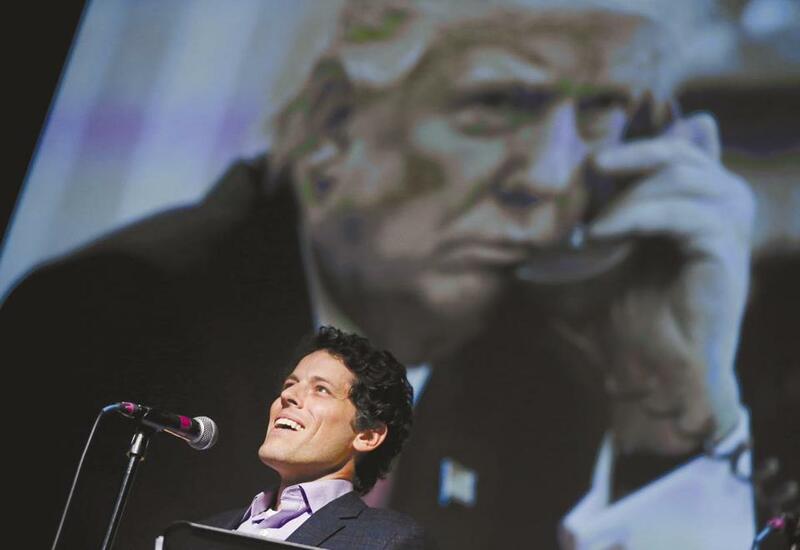 The Globe’s deputy Washington bureau chief Matt Viser shared tales about his phone calls with Donald Trump. Matt Viser, the Globe’s deputy Washington bureau chief, looked back on some memorable telephone conversations he’s had over the years with Donald Trump. In those interviews, snippets of which were played for the audience, Trump candidly discussed his college years (and how he asked Candice Bergen out on a date — and was denied), and his admiration for Patriots owner Robert Kraft, coach Bill Belichick, and QB Tom Brady. Trump also expressed his disdain for a satirical front page that the Globe ran in April 2016. The project imagined a variety of news stories from a potential future Trump administration as well as an editorial on the candidate’s heated rhetoric. Trump admitted to Viser that he got a copy of the mock front page and promptly threw it away. Mike Bello and Shirley Leung told the audience about some of the strange story ideas they have received. Names reporters Meredith Goldstein and Mark Shanahan talked about some of their most embarrassing celebrity encounters. souvenir she prizes from that close encounter (a cup and saucer used by Timberlake himself). Multimedia journalists Taylor de Lench and Scott LaPierre screened a short documentary they made about the Globe’s mammoth presses in Dorchester and the pressmen who operate and maintain them. Reporter Neil Swidey told the audience about meeting singer-songwriter Van Morrison, and played selections from a series of ridiculous songs that Morrison recorded to get out of a record contract (songs like “Dum Dum George,” “Ring Worm,” and “You Say France and I Whistle”). Janelle Nanos and Kai Martin shared the stage at the “Globe Live” event. 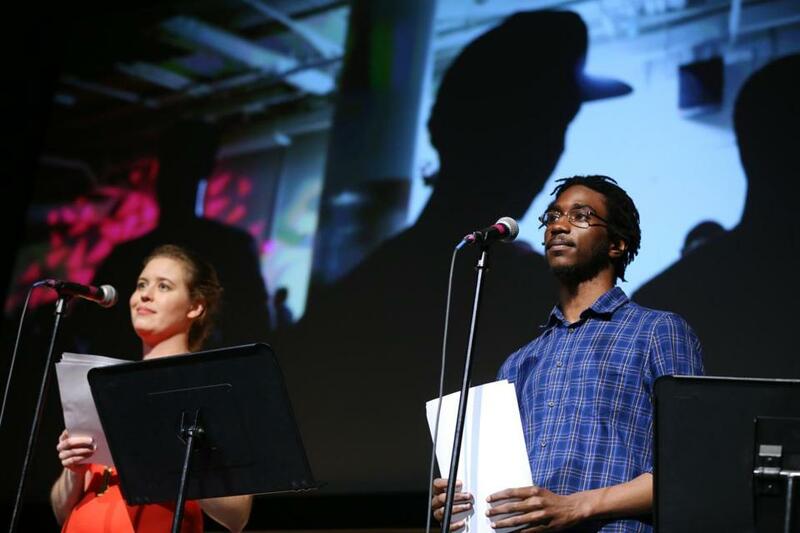 Reporter Janelle Nanos shared the stage with Kai Martin, and together they told the story of how Martin overcame challenges as a teenager to become a successful coder, now working as a full stack developer for the Globe. The journalists — most often found toiling at their computers or in the field interviewing subjects — got a little coaching to smooth their transition to the stage. 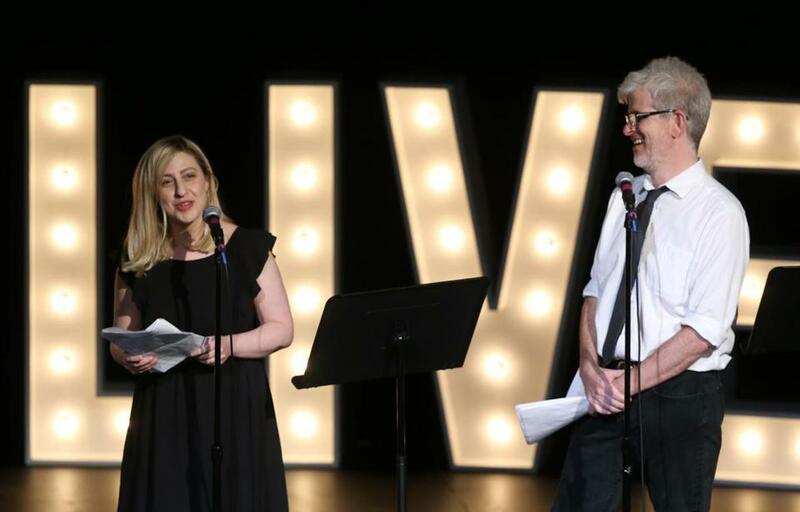 Director Daniela Varon, a veteran of Shakespeare & Company in Lenox, worked with staffers on their storytelling chops and how to overcome opening-night jitters. Singer Niu Raza entertained the crowd.